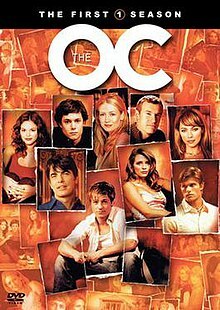 The first season of The O.C. commenced airing in the United States on August 5, 2003, concluded on May 5, 2004, and consisted of 27 episodes. It tells the story of "the Cohen and Cooper families, and Ryan [Atwood], a troubled teen from the wrong side of the tracks" who is thrust into the wealthy, harbor-front community of Newport Beach, Orange County, California and "will forever change the lives of the residents". The first seven episodes of The O.C. aired in the US on Tuesdays at 9:00 p.m. on FOX, a terrestrial television network. Following a seven-week mid-season hiatus, the remainder of the season aired on Wednesdays at 9:00 pm. The season was released on DVD as a seven disc boxed set under the title of The O.C. : The Complete First Season on September 26, 2004 by Warner Bros. Home Video. On June 17, 2008 the season became available to purchase for registered users of the US iTunes Store. In the United Kingdom the season premiere aired at 9:00 pm. Sunday March 7, 2004 on Channel 4 with the second episode airing immediately after, on sister station E4. After taking a hiatus over summer, the show returned in early September to a 1:00 p.m. slot as part of T4. In Canada it aired on CTV Television Network and in Australia it was first broadcast on Nine Network, but dropped it after three episodes. Network Ten subsequently picked up the show, airing it in its entirety. The season was produced by Warner Bros. Television, Hypnotic (now Dutch Oven) and Wonderland. The executive producers were creator Josh Schwartz, Doug Liman, Dave Bartis and McG, with showrunner Bob DeLaurentis joining them after the pilot episode. Melissa Rosenberg and Allan Heinberg served as co-executive producers. Stephanie Savage was supervising producer and Loucas George producer. The staff writers were Schwartz, Savage, Heinberg, Rosenberg, Jane Espenson, Debra J. Fisher, Erica Messer, Brian Oh, J.J. Philbin and Liz Friedman. The regular directors throughout the season were Liman, Sanford Bookstaver, Michael Lange, Patrick Norris, Michael Fresco, James Marshall and Sandy Smolan. Season 1 cast; from left to right: Jimmy, Summer, Marissa, Julie, Ryan, Sandy, Kirsten, Seth and Luke. The initial season had nine major roles receive star billing. Benjamin McKenzie portrayed protagonist Ryan Atwood, a troubled teenager who is thrust into the wealthy lifestyle of Newport. Mischa Barton played the girl next door, Marissa Cooper, with Tate Donovan starring as her financially troubled father Jimmy. Adam Brody acted as geeky ostracized teenager Seth Cohen with Kelly Rowan playing his mother Kirsten, the powerful businesswoman, and Peter Gallagher portraying his father, Sandy, a public defense attorney. Chris Carmack portrayed Marissa's boyfriend Luke Ward. Originally only guest stars, Melinda Clarke starred as Marissa's mother, Julie Cooper, and Rachel Bilson played Summer Roberts, best friend to Marissa and Seth's object of affection. Both gained contracts to the main cast list after thirteen episodes. Numerous supporting characters were given expansive and recurring appearances in the progressive storyline, including Samaire Armstrong as Anna Stern, Alan Dale as wealthy businessman and father of Kirstin, Caleb Nichol. Taylor Handley played Oliver Trask, a psychotic character who viewers loved to hate. Amanda Righetti starred as Kirstin's younger sister Hailey Nichol. Navi Rawat played Theresa Diaz, childhood sweetheart of Ryan. Bonnie Somerville acted as Rachel Hoffman, a former colleague of Sandy, and Ashley Hartman portrayed Holly Fischer a friend of Marissa and Summer. Other guest stars in recurring roles include Linda Lavin as Nana Cohen, Daphne Ashbrook as Ryan's mother Dawn and Michael Nouri as Summer's father Neil. Actors Bradley Stryker, as Ryan's brother Trey, and Shailene Woodley, as Marissa's younger sister Kaitlin, were both only guest stars at this point. However both these characters, portrayed by different actors, would return to a larger role in later seasons. The pilot episode of the season gained 7.5 million viewers and was nominated for a Writers Guild of America Award for best episodic drama. As the season progressed, ratings picked up with 8 million viewers tuning into for the third episode and 8.6 million viewers watching the fourth installment. This resulted in FOX initially ordering an additional six episodes. The season was split into two parts, the first consisting of seven episodes shown weekly, which averaged 8.43 million viewers. This was followed by a seven-week hiatus, in which FOX announced it had ordered another five episodes, bringing the total season to twenty-seven. The time-slot for the second half of the season was originally planned for Thursday nights, but facing competition from CSI: Crime Scene Investigation on CBS and Will & Grace on NBC it was moved to Wednesday nights at 9:00 p.m. instead. Overall season one was the highest-rated new drama of the season among adults aged 18 to 34, averaging a total of 9.7 million viewers. The show picked up four Teen Choice Awards and was nominated for another two, as well as getting nominated for the Outstanding New Program TCA Award. In the UK, its two showings a week averaged 1.2 million viewers, and it was one of the highest rating Sunday daytime programs, also attracting fans to E4 on Monday nights. It was also well received in Australia, picking up a Logie Award for Most Popular Overseas Program in 2005. The review aggregator website Rotten Tomatoes reported a 77% approval rating with an average rating of 6.56/10 based on 22 reviews. The website's critical consensus reads, "Even though it lacks an original take on teen angst, The O.C. functions well enough for its target audience, churning plenty of soap storylines out of a talented cast." Metacritic, which uses a weighted average, assigned a score of 67 out of 100 based on reviews from 17 critics, indicating "generally favorable reviews". However, the show did come in for some criticism. San Jose Mercury News criticized the plot and the casting saying that "the storylines usually involve the obligatory three-episode-arc drug problems or lost virginity with dialogue designed to keep a dog up to speed", and that "Whoever at FOX thought Benjamin McKenzie (Ryan on "The O.C.") could pass for anything younger than 25 should be fired". A DVD review was critical of the repetitive plot stating that "the Ryan-Marissa fol-de-rol gets tiresome as it devolves into relentless bad timing", while Entertainment Weekly did not think the acting was always up to scratch, stating "it's unfortunate to have all this potential for arm-flinging drama invested in Barton, an actress who can be as flat as a paper doll". It was also denounced for excessive brawling and glamorizing underage drinking. Just after Ryan escapes jail time and is kicked out by his mother, his attorney, Sandy Cohen, brings him home, to the dismay of his wife, Kirsten. Ryan meets their son, Seth, and other Newport teenagers who lead him to trouble, making Kirsten think again about letting Ryan stay in their home. Marissa and Seth convince Ryan not to leave Newport, and hide him in one of Kirsten's vacant model homes. When Luke confronts Ryan about his relationship with Marissa, their fights ends up setting the model home on fire, getting them both arrested. Sandy comes to Ryan's rescue once again. Kirsten decides to invite Dawn to an elite Casino Night, but she gets lost in the sauce, disappointing Ryan. Dawn believes Ryan is better off with the Cohens, leaving him with Sandy and Kirsten. Now that Ryan is staying with the Cohens, he must attend the Cotillion Ball, where Newport's finest young ladies enter society. Luke's jealousy results in Ryan escorting Marissa. Jimmy becomes a suspect of a fraud investigation and Holly's dad decides to confront him at the Ball in front of everyone. Ryan gets a job and meets Donnie, a Newport teen from Corona. Seth decides to invite Donnie to Holly's beach party, but his attendance ends with Luke getting shot. Julie tells Jimmy she wants a divorce. Kirsten's father, Caleb Nichol, comes to town with his new 24-year-old girlfriend, Gabrielle. Marissa isn't ready to pick between Luke and Ryan, but when she walks in on Ryan with Gabrielle, she chooses Luke. Summer's growing feelings for Seth begin to show. Marissa doesn't take her parents' divorce well, and when she finds Luke with Holly during an end of summer trip to Tijuana, she's found passed out in an alley due to a drug/alcohol overdose. Kirsten, upset that Sandy is considering the job, finds herself in a compromising position with Jimmy in his new apartment. Julie blames Ryan for Marissa's incident and tells him to stay away. Sandy starts his new job, and Kirsten is displeased with his new coworker, Rachel. Ryan must take a placement test to determine his enrollment at The Harbor School. Julie tries to get Marissa to see a therapist in San Diego, contrary to what Jimmy and Marissa want. Ryan doesn't feel like he belongs at Harbor and Luke doesn't help his situation. Summer keeps her friendship with Seth private, but is jealous of his relationship with Anna. Sandy accepts a case against Caleb at his new job, that will test his relationship with Kirsten. Kirsten becomes worried about Sandy's professional relationship with Rachel. Ryan spots Caleb and Julie together, and becomes responsible for Marissa outing their private relationship at a charity event. Summer tells Seth how she feels. Ryan and Marissa go to Chino to visit Trey for Thanksgiving, but he asks Ryan for a favor. Seth must choose between Anna and Summer. Kirsten and Sandy make an attempt to set up Jimmy and Rachel. Ryan's trust is put to the test when he and Luke spot Carson with another man. Seth struggles to reconcile with Anna and Summer. Caleb and Julie agree to separate for a while. Jimmy and Sandy go into business together. Kirsten learns something about her father that'll help Sandy's case, but will put her job in jeopardy. Ryan's Christmas does not go as planned. Marissa meets someone in therapy. Meanwhile, Seth struggles choosing between Anna and Summer. Kirsten's sister, Hailey, crashes at the Cohen's home and throws a New Year's Eve party that gets out of control. Ryan is worried about Marissa's relationship with Oliver. Anna decides to spend her night with Seth, without Summer's knowledge. Hailey realizes she is no longer welcome at the Cohen residence. Oliver invites the gang to a Rooney concert, but Ryan catches him in a drug deal in the parking lot. Seth has difficulties telling Summer about his relationship with Anna. Oliver's friendship with Marissa strains her relationship with Ryan. Summer becomes jealous of Seth and Anna's relationship. Meanwhile, Hailey and Kirsten clash when Kirsten convinces Caleb to cut her off. Oliver transfers to Harbor, while Ryan risks his academic future to expose him. Seth becomes jealous of Summer's relationship with Danny, forcing him to doubt his relationship with Anna. Meanwhile, Jimmy and Sandy go into business together. Also, Kirsten gets worried about the company when Caleb hires Julie as an interior designer. Luke starts to see Oliver's true colors after he gets Ryan suspended, but Marissa won't see it. Anna confronts Seth about his relationship with Summer. Meanwhile, Caleb gets Kirsten to break up with Julie for him. Ryan and Marissa need to rebuild trust after the incident with Oliver, but it's hard when Theresa comes to town. Jimmy discovers he has a secret admirer, while Luke spends the night with Julie. Meanwhile, Seth and Summer come to terms with their feelings for each other and consummate their relationship. Ryan realizes Theresa isn't telling him the truth on why she's staying in Newport. Summer keeps her relationship with Seth private, turning him to Anna for support. Meanwhile, Sandy finds himself in the middle of Caleb's mess. Also, Jimmy suspects something between Julie and Luke. Seth feels guilty when Anna announces she's moving back to Pittsburgh. Legal troubles brew for Caleb and Kirsten, while Sandy works to solve them. Luke and Julie find their secret affair harder to maintain. Meanwhile, Theresa's boyfriend from Chino arrives bringing trouble. Ryan, Marissa, Seth and Summer head down to L.A. and find Hailey working as a stripper. Jimmy and Sandy approach Caleb for business help. Meanwhile, Ryan tries to keep Luke and Julie's affair a secret from Marissa. Sandy's mother from Florida comes to Newport for a visit with a different attitude. Ryan searches for Marissa. Summer tries to impress Nana. Jimmy and Hailey take a step forward with their newfound romance. Marissa doesn't want to hear what Luke has to say, but gives him a chance after a near-fatal car accident. Meanwhile, Jimmy becomes an obstacle in getting a liquor license. Caleb proposes to Julie. Kirsten and Marissa throw a bridal shower for Julie, but Marissa invites Julie's unwanted estranged sister. Theresa calls Sandy for legal advice, but tries to avoid Ryan. Hailey and Jimmy continue their romance. Meanwhile, Summer is disappointed when Seth meets her father. While the boys are in Las Vegas, Jimmy and Sandy learn Caleb's true motives. Hailey devises a plan in an attempt to get Caleb to break it off with Julie. Marissa spends the night with Theresa and discovers something that might affect her. Caleb and Julie officially get married, and Marissa moves in with them. Ryan and Theresa face a difficult decision regarding her pregnancy. Seth makes a bold move when things around him start to fall apart. The DVD release of season one was released by Warner Bros. in the US on October 26, 2004, after it had completed broadcast on television. As well as every episode from the season, the DVD release features bonus material including a preview of the second season, deleted scenes, audio commentary and behind-the-scenes featurettes. ^ "The O.C." Warner Bros. Archived from the original on May 14, 2008. Retrieved June 26, 2010. ^ "The O.C. – The Complete 1st Season". TVShowsOnDVD.com. Archived from the original on June 21, 2008. Retrieved July 10, 2008. ^ Clark, Caren (March 6, 2004). "Switched on this week the best bits on TV". Southport Reporter. Retrieved July 16, 2008. ^ Wilkes, Neil (July 27, 2004). "'The O.C.' set for UK return". Digital Spy. Digital Spy Ltd. Retrieved July 22, 2008. ^ Burke, Don (November 5, 2004). "Hoo-roo, forever". The Age. Melbourne. Retrieved July 19, 2008. ^ "Broadcast Upfront Presentations: FOX Part 1". The Futon Critic. May 15, 2003. Retrieved July 13, 2008. ^ Stanley, Alessandra (August 5, 2003). "TELEVISION REVIEW; Take One Enclave, Add Rebellious Youth". The New York Times. Retrieved July 18, 2008. ^ "Backstage Pass – Insider Commentary: Stephanie Savage". The O.C. Insider. Warner Bros. Archived from the original on September 8, 2015. Retrieved July 13, 2008. ^ a b c d Maxwell, Alison; Jim Cheng (April 14, 2004). "A grown-up's guide to 'The O.C.'". USA Today. McLean, Virginia: Gannett Company. Retrieved July 11, 2008. ^ "Peter Gallagher – The O.C." PeterGallagher.com. Archived from the original on June 25, 2008. Retrieved July 10, 2008. ^ O'Toole, Lesley (October 31, 2006). "Rachel Bilson: She's the one". The Independent. Canary Wharf, London: Independent News & Media. Retrieved July 11, 2008. ^ "Backstage Pass: Episode Guide – "The Countdown"". The O.C. Insider. Warner Bros. Retrieved July 15, 2008. ^ a b c "Backstage Pass: Episode Guide – "The Links"". The O.C. Insider. Warner Bros. Retrieved July 15, 2008. ^ a b Barnes, Ken (April 13, 2004). "Five reasons you should watch 'The O.C.'". USA Today. McLean, Virginia: Gannett Company. Retrieved July 11, 2008. ^ Ausiello, Michael (February 11, 2004). "O.C. Exec Defends Oliver". TV Guide. Archived from the original on June 12, 2008. Retrieved July 16, 2008. ^ "Backstage Pass: Episode Guide – "The Hearbreak"". The O.C. Insider. Warner Bros. Retrieved July 15, 2008. ^ a b "Backstage Pass: Episode Guide – "The Rescue"". The O.C. Insider. Warner Bros. Retrieved July 15, 2008. ^ "Backstage Pass: Episode Guide – "The Pilot"". The O.C. Insider. Warner Bros. Retrieved July 15, 2008. ^ "Backstage Pass: Episode Guide – "The Homecoming"". The O.C. Insider. Warner Bros. Retrieved July 15, 2008. ^ "Today's News: Our Take". TV Guide. August 7, 2003. Retrieved July 5, 2008. ^ "Today's News: Our Take". TV Guide. August 27, 2003. Retrieved July 5, 2008. ^ a b "Today's News: Our Take". TV Guide. August 28, 2003. Retrieved July 5, 2008. ^ Ford Sullivan, Brian (October 20, 2003). "FOX EXTENDS 'THE O.C.' TO 27 EPISODES". The Futon Critic. Retrieved July 5, 2008. ^ "Today's News: Our Take". TV Guide. October 20, 2003. Retrieved July 5, 2008. ^ "Ratings shine in 'The O.C.'" (Note: Payment required). USA Today. McLean, Virginia: Gannett Company. March 2, 2004. Retrieved July 20, 2008. ^ "I.T.R.S. Ranking Report: Primetime Mon-Sun". ABC Medianet. June 2, 2004. Archived from the original on February 8, 2007. Retrieved July 20, 2008. ^ "The Television Critics Association Awards Archived July 15, 2008, at the Wayback Machine", Television Critics Association. Documented at "Complete list of nominees Archived July 1, 2017, at the Wayback Machine" (XLS). Retrieved on July 17, 2008. ^ Elsworth, Catherine; Born, Matt (May 3, 2007). "Bush twins endorse the sultry soap taking over from Friends". The Daily Telegraph. London. Retrieved July 19, 2008. ^ "Logie award winners 2005". The Daily Telegraph. Sydney: News Limited. October 16, 2004. Retrieved July 23, 2008. ^ "THE O.C. : SEASON 1". Rotten Tomatoes. Fandango Media. Retrieved February 18, 2019. ^ "THE O.C. : SEASON 1". Metacritic. CBS Interactive. Retrieved February 18, 2019. ^ Dorr, Gregory P. "The O.C. : Season One". DVD Journal. Retrieved July 17, 2008. ^ Flynn, Gillian (November 19, 2004). "TV Review – The O.C." Entertainment Weekly. Time Inc. Retrieved July 17, 2008. ^ Isaac, Steven (October 2003). "The O.C." Plugged In. Archived from the original on May 8, 2006. Retrieved July 20, 2008. ^ a b c "Complete First Season". Warner Bros. Retrieved September 9, 2008. ^ "The OC: The Complete Season 1 (UK)". Amazon.co.uk. Retrieved July 2, 2008. ^ "The OC – Season 1 (Aus)". DVD Orchard. Archived from the original on December 5, 2008. Retrieved July 2, 2008.